The time has come when we need to show our gratitude to our veterans for shielding our freedom and us whenever we were in danger. To all the veterans, dead or alive, a big thank-you from the team of Pet Care Supplies and all the pet owners. We genuinely owe our freedom and sense of security to you and the war dogs that contributed as well. Pet care Supplies is happy to announce a discount of 8% to show gratitude to all the veterans and war dogs. We thank all the customers who have been with us from the start and welcome the new ones heartily. This Gratitude sale will let you buy the best of pet supplies at much affordable rates than they are placed on the rack. Let’s go through the brief description of PCS and what this sale is about! Pet Care Supplies- What do we offer? We have been among the pet owners for quite a time now and in a short span of time Pet Care Supplies has received a place among the top sellers of the country. We are highly preferred by pet owners for pet care products of dogs and cats. Our online store provides unrivalled brands for categories: flea and tick control, wormers, wound repair and joint care for both, canines and felines. Veterans Day Gratitude Sale- How will it benefit you? Pet Care Supplies offer the best brands of pet care products at discounted rates. You may find our products labeled with much lower price than found at other online stores. 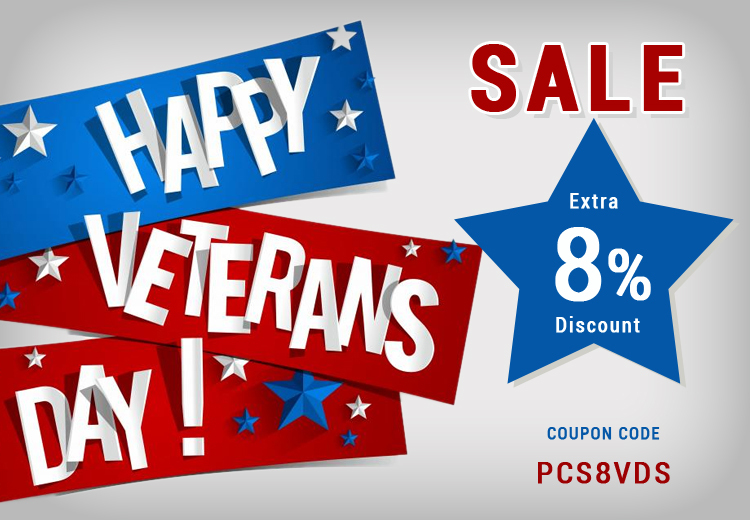 This benefit is intensified by Veterans Day sale and you may avail our bet brands at 8% off. Moreover, this may be the best opportunity to try new products as the prices are lesser than the usual. We offer free shipping to the remotest corner of the country irrespective of the order value. Buying pet supplies during this sale will save you big with discounted price + extra 8% off + free shipping on every product. Pet Care Supplies believes in providing complete customer satisfaction, thus we provide money back and buy safe guarantee to all customers. To conclude, Pet Care Supplies is extending an invitation to buy the best products at the best prices and grab the chance to save on this Veterans Day. Visit, Order & Save! Use coupon code: PCS8VDS while checking out.